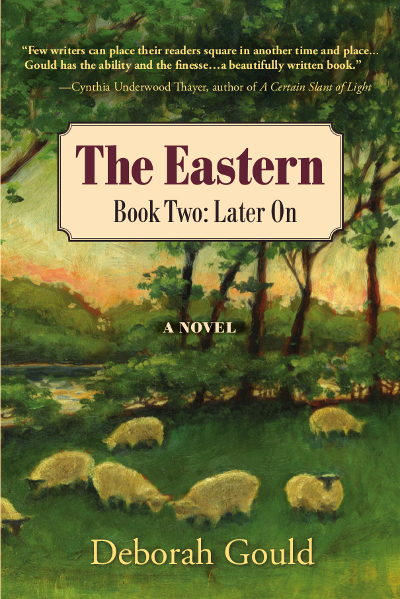 The highly anticipated The Eastern, Book Two: Later On! After the Civil War, the Eastern River families of Pittston prosper during Maine’s Golden Age of Agriculture. As they move into the 20th century, however, social and industrial changes present challenges to the close-knit agrarian neighborhood. Deborah Gould once owned the Joel Thompson homestead on the Eastern River in Pittston, Maine. She has lived on a dairy farm, owned a graphic arts business, and worked in English language acquisition for students with cochlear implants. A three-season resident of Brunswick, she summers on Flying Pond in Mt. Vernon.